So here’s what became of that big basket of blackberries we picked on Sunday. 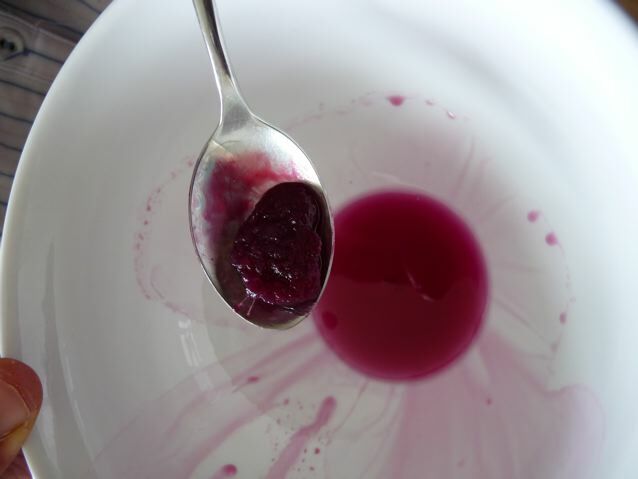 Testing for Pectin – how on earth do you know how much pectin is in any particular batch of fruit? There are guidelines, Pam Corbin has a helpful list in her book ‘Preserves’ in which it says things like ‘early blackberries, medium pectin,low acid, late blackberries, low pectin’… but I am not that experienced in jam making that I can then instinctively know what to do next. 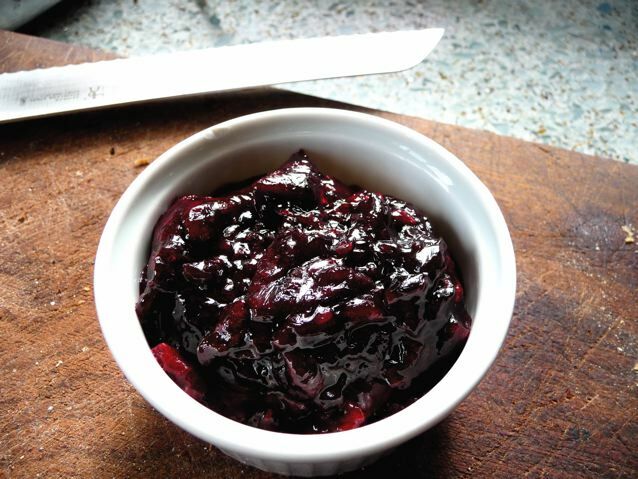 Having had the experience of the damson jam setting like concrete once and being determined never to have that happen again, I veer the other way and often make runny slippery jams that slide off the toast and onto my lap…. So each time I make jam, three or four times a year at most, I re-read my books, looking for any pearl of wisdom, this time I found something good on a site called Jam World which is full of detail, even if the bit about making jam for competitions is a bit beyond me and it is the Jam World formula I have used this time. When you have prepared the juice for the jelly (more of this later) this is the time to test for pectin. Looks like it gelled all right! Brought to a boil and then left to simmer gently to release all the juice from the berries. Put all the fruit into a jelly bag and left it to drip through for most of the day. Then did the pectin test as above, which showed there was enough pectin and then I put the juice in the fridge over night and carried on the next day. First thing I put some saucers in the freezer to help me test the set later and prepared the jars, keeping them in the oven until they were needed. You then add 1lb of sugar for every 600 ml/pint of juice. For this batch that was 1230 grams of sugar. I used preserving sugar which has larger crystals and has a reputation for giving a better jam. I warmed the sugar in the oven first and added it slowly to the juice, making sure the sugar was completely dissolved before bringing it up to the boil. I did quite a lot of skimming and saved the scumble (the jammy scum which I think is very tasty though it doesn’t look that pretty) which I will have on my toast this week. Using a sugar thermomenter we started testing for a set once the temperature got to 104 C. Jellies usually set between 104 and 106c. Ours set after about 12 minutes altogether and had reached a temperature of 106 C. We did three checks during that time, turning the gas off while we checked. Check for a set by putting a little of the hot jelly on a cold saucer, leave for a few minutes and then push it gently with your finger, it if wrinkles as you push it, it is ready. Another thing you can do is hold a wooden spoon over your pan and observe the drips, if they look like they are setting that is another clue. Brian carefully filled the jars and put the lids on (they had been simmering in a saucepan of water) and I wrote some labels this morning and here they are. Just under 5 lbs of jam to look forward to sharing around with family and friends. Jam jars with spotty lids came from the jamjarshop website by the way. We ran out of small jars last year so I ordered these when they were on sale. Some friends are good and keep all their jars to give to us… and then they get more jam! One year on.… Lots of people seem to read this post still, and I had another look at it this August (2011) as Carl Legge had kindly suggested it as a good read on Twitter. I realise that I never posted a picture of the jelly itself. What an omission! Believe it or not, I have one jar left in the garage and tonight I dug it out and opened it and here is a quick photo. It has darkened a little and become a little grainy in texture; it is a year old but it still has that wonderful complex fruity taste that sings of the English countryside. I love blackberry jelly! 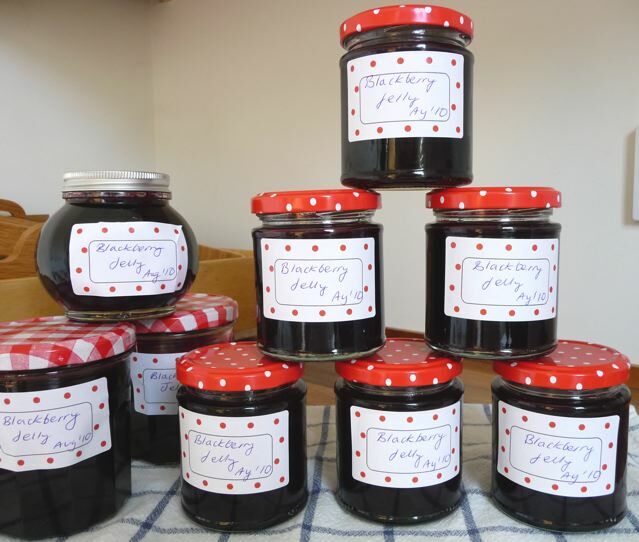 This entry was posted in Dog Walks, Preserves and Cordials, Recipes, Wild Food and tagged blackberry jelly, jam world, Pam Corbin, preserves, testing for pectin on 06/08/2010 by Joanna. Your blackberry jelly looks amazing Joanna. I’ve made quite a bit of jam (and sometimes cheat by using jam sugar…) but can’t be bothered with the faff of straining the fruit to make jelly. I’m very impressed! I also wish I knew a good place for blackberrying near me, I can’t imagine where I’d find that many blackberries in one place! Good info about the pectin test, although I have to admit to not having the required meths available immediately to hand! I’ve just bought (well, my brother bought for my birthday – love him!) Pam Corbin’s preserving book but I haven’t had a chance to look at it yet. I also got the bread one at the same time, which is a good read – but then I’ll read most things about bread! I hope you really enjoy your jelly spread on some of the delicious bread you bake, and a generous amount of butter too! How interesting the checking for pectin method. I will have to remember this post next time I’m not sure. Usually I just whack it in and hope for the best, (hack, I know am.) That blackberry jam is just asking for a soft warm scone I think. I was eyeing off a mulberry tree I found in an alley way the other day thinking… I wonder how I can get up there? Looks as good as I bet it tastes. Bless Pam the Jam. Have you seen the Hedgerows book in the River Cottage series? No but I saw an advance press thing. Is it good? A thousand things to make with wild garlic etc etc? This foraging is catching on, well it was probably always on, just I notice more maybe? There is one lovely chap called Q , (golden retriever) who confessed to making elderflower panna cotta the other day…and a rather superior dog walker (4 dogs – always different) chap who told me he took 8 lbs of mirabelle plums from the top of the tree, using a fruit claw he bought in Lidl for £4.99….and then John (deep sea fishing, no bass this week, blonde lurcher) who spent a happy half hour looking for the wild raspberry canes that he swore he saw last year. MMmmm! I want some on toasted rye, please. Your labels look great- your jars festive- and your jelly- just beautiful. What fun to make jelly! Especially from your own foragings, Jo. This method was used for pectin testing when a friend and I made up some pectin stock from apple peelings, according to Celia’s instructions on her blog. It was gloopy straight away…very freaky! Love your cute spotty jar lids and labels to match :) Have you opened a jar yet? Please tell me you’ll keep a jar for yourself and not give it _all_ away..? I’m still eating the skimmed pot. So I haven’t opened one of the spotty pots yet. They come from the jamjarshop, very smart. Usually I use recycled jam jars but I couldn’t resist these ones. You’re right Christine ! Celia is a jam expert, unlike me and probably being doing it longer. I haven’t done making pectin stock, maybe because I don’t make jam from low pectin fruits like strawberries which no one eats in this house, so I’ve never needed to do it. Love the spotty lids. I love a shelf full of homemade preserves (several actually) – it’s so satisfying. Ah Choclette, I end up with shoeboxes full of them and then I forget them…until someone asks for them. I thought all last years blackberry jelly was long gone and then I found four jars, we have been reorganising the garage again; opened one and it was still good. I like the fact that if it’s home made only you have to decide on its best before date! Jo, this looks sensational. I’ve not made jellies before. It’s sounds scrumptious. And how fantastic that you were able to pick all the fruit yourself. Dan, I’ll open a jar soon and take a pic of what’s inside, the stuff in the pic above is the skimmings off the top so not very clear, I have some rowan berries and apples and am going to make a teeny weeny batch of rowan jelly using the same method. Not sure if I will like it though…. I think I may be addicted to pickling and jamming! Blackberry picking is next on my list now the redcurrants have gone over! I just ordered some Pomona pectin, http://www.pomonapectin.com/ which is activated by calcium, not sugar – so doesn’t require those usual huge amounts of sugar – supposed to make jams and jellies a bit more consistent – we’ll see. I used to think that it was the jams which were on the top of the preserving world’s skill level, but now believe that jellies are the true test. Look forward to hearing all about the results. I make blackberry jelly because I don’t like the pips, otherwise I always make jam as I prefer preserves with texture and fibre in them. I’m way out of step with my consumption though, I just opened a jar of last year’s wild cherry jam. I get through maybe a jar of jam/jelly every two months. I make it for fun and I give 95% of it away to family and friends. Hi everyone – I’m also a huge fan of Pam the Jam and my lovely hubby bought me her book and the bread one. I’m now preparing to make all sorts of jelly – rowan, elder and rosehip. Also hedgerow when I can get my hands on some crab apples. My guilty pleasure is a stainless steel steam juicer purchased from Westfalia recently. It steams the fruit and you use the juice to make your jelly – no more hassle sieving the seeds or straining through a jelly bag. Yes they can be a bit pricey but they are often in the sales (think my one was just over £50) but its a solid German make and will last for ever (as long as I dont forget it and let it boil dry!!!) and will be passed on to my daughter who already has her eye on it. You just wash the fruit and roughly chop it up and chuck it all in huge pan on top – the juice collects in the middle section and water boils in one below that. There is a little tube which fits onto middle section and the juice is siphoned off from there when all juice has been collected. You can still use the remaining pulp to make jam or jam cheese with if you want. I’m so excited about it plus it can be used as a conventional steamer for meat and veg or to make stock. Sorry – I’m not getting paid to say this, I just get bit carried away! Hi Maura, it sounds like a totally wonderful thing and I might have to ask Father Christmas for one….. thanks for the suggestion, I am sure lots of people will be interested! Edit : I found one here but it is very expensive – ah ha, i just googled westfalia and found yours, did you have to buy the drainage tube separately, it looks like it’s an addon ? Ha ha – me too. However, I did pluck up the courage and ask, and you know what, the guy was only too pleased to get rid of them. He said take what you want I only throw them away. Sadly the ones on the tree not ripe yet – seems October is the time for them. Lots had fallen off onto the pavement and were squished but on the tree hard as rocks. So I’ll just have to be patient! I also knocked on a house at bottom of my road as I knew an old chap lived there and could see piles of windfalls rotting in his garden – mostly eating apples. Again he was so pleased for someone to take them so I spent an hour picking the lot up and took rotten ones away for him as well. Was least I could do as he let me have all his apples. Found out he is 95, bless him. So will make an apple pie and drop that in later as well. I noticed there had been lovely big purple plums but sadly all now rotted on ground. Wish I had asked sooner as would have done both of us a favour. I can easily spare some jam or something for someone like that. If you dont like asking why not write a polite little note and ask – I’m sure they wont mind. Next door usually gives me her windfalls, I have already picked some of my apples and pears, baskets everywhere. I might ask the crab apple house…. Have you ever tried making apple cider vinegar? I think from the book ‘Wild Fermentation’. Carl has written about it on his blog here. I know lots of people who are trying it this year, I’m not sure whether I’m going to yet. Got to find a space for it.